Smart is different from sharp. 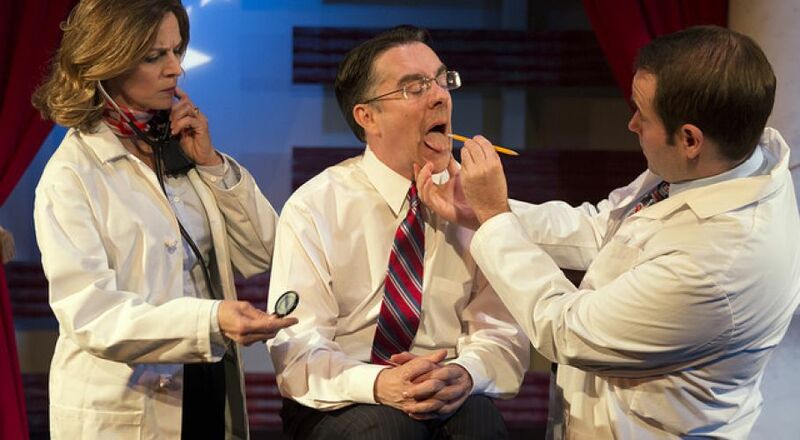 “Electile Dysfunction,” the satirical revue Tony Braithwaite concocted with Will Dennis and Tracie Higgins for Act II Playhouse, is not the most incisive in the sense of skewering all who dare to run for the Presidency in 2016 by revealing their foibles and idiocies. It doesn’t go into for commentary or even blatant partisanship. It does something better, more lasting, and more entertaining. It perceptively picks out the flaws in the current candidates’ personalities and presentations using sketches, impersonations, and ready humor to show where Mr. Trump and Mrs. Clinton may be sorely lacking. Puns, pokes, and irreverent portrayals take the place of debating issues or trying to show off political astuteness. Braithwaite, Dennis, Higgins, and even pianist and occasional time filler, Owen Roberts, are keen observers who use the snide remark, the knowing leer, and a gift for both language and imitation, to have fun while getting points across that all candidates provide something at which you can laugh. “Electile Dysfunction” may not take candidates to task, but it shrewdly shows them for who they are and why they are not the most popular duo that ever vied to become the U.S. Commander in Chief. It’s the small but perfectly aimed gibe, the clever play on the candidates’ own words or shortcomings, and the perceptive take on what amounts to self-sabotage in both camps that is so winning here. Braithwaite, Dennis, Higgins, and Roberts are just flat-out funny. They provide a good time while tweaking the noses of certain people who have put themselves forward, heaven help us, to be our leader. It’s theatercraft, not satire, that drives “Electile Dysfunction,” yet what Braithwaite and company show indicates they know how to read the field of play and what in it leads to comedy. Braithwaite, in particular, has a ball trotting out dead-on mimicking of not only Donald Trump, who he has down to a “really terrific, I mean it,” but all of the Presidents from Richard Nixon to Barack Obama with a little JFK, FDR, and Andrew Jackson thrown in for good measure. Well, Tony tells us that’s what Andy Jackson sounded like. He wouldn’t tease us, would he? Braithwaite’s imitation are gems and makes one wonder where the Rich Littles, John Byners, and David Fryes are in this generation. Have voices and mannerisms become so bland, no one is worthy of mimicking? Do stars and politicians fade so fast, no one will remember who you’re doing the way they would immediately recognize Jimmy Cagney, John Wayne, Katharine Hepburn, or Humphrey Bogart? No matter. Tony Braithwaite restores impersonation to high entertainment art. Not only are his voices on the mark, but he has each prexy’s mannerisms and facial expressions down pat, and — Here comes ‘smart’ again — knows the exact buzzwords that denote each President. It would be difficult to say which imitation was the most entertaining, but the one that goes much for the jugular is Donald Trump, whom Tony has down to each repetition, interjection, and roundabout way of saying nothing but assuring you you’ll love it. “Electile Dysfunction” is more than a smart gag title. It’s the premise for a sketch is which Braithwaite comes as a patient to doctors Dennis and Higgins with a complaint that the upcoming election has left him listless, unmotivated, unaroused, and unable to act with his usual decisive prowess in a voting booth. It’s a great gambit. It deftly expresses a conundrum many are experiencing and finds a classic comic form to present it. Masterful. Higgins goes on doing Hillary in hilarious, uninspired, uninspiring monotone until the candidate is interrupted by two men charging down the aisle. From the minute you hear Braithwaite yell “stop” and ask who is issuing such horrendous sounds, you realize the joke coming into play. Soon he and Dennis are on stage in formal attire under rain gear as Henry Higgins and Col. Pickering, the former betting the latter he can make this oratorical dishrag into a stirring speaker in a matter of months. The three performers erupt in a parody on “The Rain in Spain,” and you see genuine satire instead of troupers just trying to make fun of or even support Hillary Clinton. The next part of “Electile Dysfunction” works in spite of my lifelong loathing of man-on-the-street interviews not conducted by Jimmy Kimmel or his pal Guillermo. Braithwaite takes to the Ambler corner that contains Act II and the Plymouth Meeting Mall to ask people about their voting preferences in 2016. Surprisingly, the lengthy segment works. At least as long as the video player projecting the images holds up, (There were technical difficulties on opening night.) It isn’t that anyone says anything particularly funny or unexpected, but Tony is a game questioners, and few of the responders — Well, there’s this one man — take themselves seriously enough to make the piece too partisan or obnoxious. While the video is allegedly running, Braithwaite and Dennis are getting ready for the best part of the evening, a long skein of imitations. Of course, the first victim is Donald Trump, and Tony has every nuance of the Trump persona, vocabulary, phraseology, and inarticulateness down to a T.
In another burst of inspiration, Braithwaite doesn’t have Trump run for President of the United States. He has him vying to become the mayor of Ambler against incumbent Jeanne Sorg, who makes Hillary look glamorous based on her clothes and hairdo as she appears on tape welcoming audiences to the Ambler movie theater. Braithwaite’s Trump rakes Sorg over the coals using the same tactics he uses to roast Hillary. The idea works, but I can’t say enough how brilliantly and perfectly Braithwaite nails Trump. Trump’s campaign speech leads into a press conference in which various Presidents comment on everything from e-mails, including one of two who could not have heard of e-mail, and other issues that pertain either to 2016 or their time in office. Setting up as Richard Nixon, Tony keeps Dennis cracked up in the aisle. Any time anyone mentions President Clinton, Higgins comes out from the wings to take a bow as Hillary. Misguidedly because the reference is always to her husband, Bill. After a few times having to slink off stage while Bill holds the spotlight, Higgins’s Hillary screams “Goddammit” in a tone that shows Henry Higgins and Pickering did their jobs. Next to man-on-the-street, the theatrical stunt I hate most is audience participation. I don’t think anyone who has not had the benefit of rehearsal should be called to a stage. Tony Braithwaite’s shows often take my teeth off edge in this regard. “Electile Dysfunction” was no exception. A guy named Jack was ushered on stage from the audience. He and Tony traded badinage in which you once again see Braithwaite’s quickness and power of observation. The cast deftly elicits biographical information from Jack and then do something remarkable. Using actual riffs from the hit musical “Hamilton” as their model, they tell Jack’s story in improvisational hip-hip, using tunes and some words from “Hamilton” in their admirable presentation. Tony Braithwaite is the show’s director. 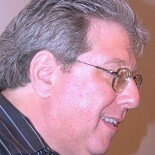 Patrick Romano was assisted director and worked with Braithwaite, Higgins, and Dennis on the writing. Owen Roberts, in addition to playing piano, supplies some political humor. Adam Riggar’s set is large, colorful, and gives off the vibes of the kind of lively, fast-paced show “Electile Dysfunction” is. Oh, and give Pat Sabato a hand for wrestling with and getting the better of that video player. Looking for cutting edge? “Electile Dysfunction” is not your cup of brine, although it has oodles of bright moments. Looking for laughs and a smart comic approach to politics? “Electile Dysfunction” is your ticket, and if I was you, I’d buy one soon. The show vacates the Act II premises on October 9. This entry was posted on September 20, 2016 by nzoren in Theater Reviews and tagged Act II Playhouse, Ambler Pa., Electile Dysfunction, Owen Roberts, Patrick Romano, Political, Revue, Satire, Tony Braithwaite, Tracie Higgins, Will Dennis.